When a game ends with such a comprehensive a gap between the sides, all there is to do is to sit back and marvel at the performance of the victors. For Ardnaree, it’s been a long 44 year wait since they last claimed the Mayo junior title. There have been plenty of close misses over the years since then, no more than in the past decade where they have had to head back to their enclave on the north side of the Moy after tasting defeat in the 2009, 2011, 2012 and 2013 finals. After dismantling Ballina Stephenites B in the quarter-final and then running riot through Ardagh in the semi-final they entered the game as rightful favourites, but one could forgive them for being nervous after so many near misses in recent years. But on Sunday in MacHale Park they hit the ground running and never took their foot off the gas, even when the result was beyond doubt. The game started off with both sides swapping early scores, Brendan Garvin put Killala into the lead with a well taken score after David Lowther had done well to work the space for his midfield partner. That was canceled out by a fine score from Ronan Doherty three minutes later. Ardnaree captain Eoin McCormack pushed his side in front for the first time nine minutes in with a well taken free from the right hand side of the field. That was quickly followed by a point from Michael McCormack who was played in by Noelie Beatie. Alex Quinn brought the gap back to a single point on the 13 minute mark, but that was as close as they got to their north Mayo neighbours who were just about to cut loose and run riot. Chris Walsh kicked Ardanree’s fourth point and a minute later he’d the ball in the back of the net after his snap shot for a point dropped short and Ruairi O’Hara in the Killala goal misjudged the flight of the ball. McCormack stretched out the gap to six points a minute later and when Cathal Noone pointed a free on 18 minutes there was only ever going to be one victor in this contest. Ardnaree kept piling on the pressure over the closing 12 mintues of the half and went in leading by 2-8 to 0-4 with McCormack kicking two more points and Noone finding the back of the net from close range. Killala badly needed to start the second half well if they were going to get back into the game, but Ardnaree were the ones who hit the ground running in the terminal period. After less than a minute they had the ball in the back of the net when McCormack finished for their third goal of the day. Andrew Farrell kicked back with a point for Killala a minute later, but over the next 20 minutes Ardnaree ran in another 2-4 without reply. The third goal game from Walsh who flicked a dropping ball to the net after 43 minutes and three minutes later Noelie Beatie was on hand to apply a cracking finish for goal number five. The final goal of the game came from the boot of man of the match Ronan Doherty who galloped clear of the Killala defence before firing low to the net. The celebrations had well and truly begun for the Ardnaree faithful who greeted each score with howls of appreciation and the final whistle was followed by a massive out pouring of emotion and joy. 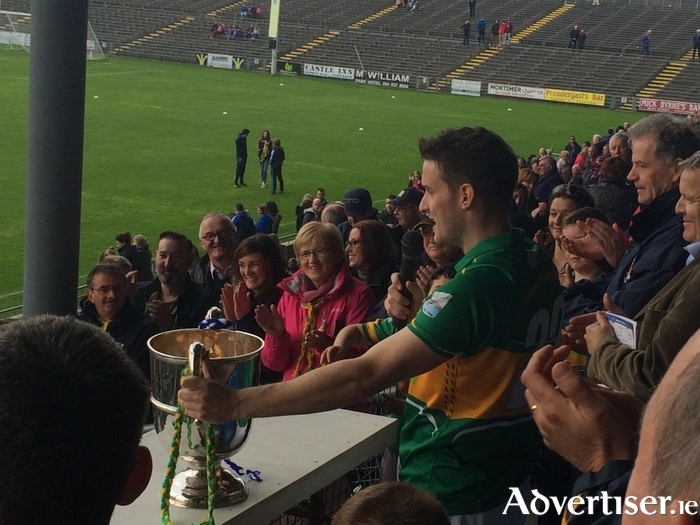 It’s been a long road for Ardnaree to get back to this stage and they soaked up every moment of it on the field, and will have enjoyed it long into the night and the days that followed it. Ardnaree: B Ginty; C Naylor, I Clarke, C Cawley; M McCormack, P Lackan, S Timlin; S Tighe, E McCormack; N Beatie, R Doherty, C Noone; M Rafter, C Walsh, R Clarke. Subs: R O’Malley for S Tighe, K McCarron for C Noone, B Fitzpatrick for M McCormack, J Egan for N Beatie, B Reilly for S Timlin, D McCormack for C Walsh. Killala: R O’Hara; K McLoughlin, M Dooher, M Barrett; M Maheady, K Dooher, S Maheady; B Garvin, D Lowther; A Murphy, A Quinn, K Walsh; D Herbert, A Farrell, C Gilvarry. Subs: G Ferguson for K Walsh, S Ryan for A Murphy, N Maheady for S Ryan, D Lowther for K McLoughlin, C Monaghan for M Maheady, C O’Dea for D Herbert.